On 19th June 50 delegates from all over Europe gathered at the Cinémathèque française in Paris to discuss the future of film education in Europe. The event marks the launch of A Framework for Film Education in Europe, which establishes a set of ambitions and outcomes for people learning about film that all educators can aspire to. 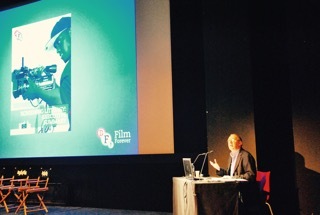 The Framework was funded from the Film Literacy strand of the Action on Audience Development, as part of the European Commission’s Creative Europe programme. This is the first time such a Framework has been devised in Europe. It gathers together intelligence and practical experience from a wide range of institutions and education providers, from universities, to cinematheques, to national agencies, small NGOs, and industry funded bodies. Ian Wall of the Film Space was part of the development group that included the BFI, Vision Kino from Germany as well as representatives from 25 partners from Lithuania to Portugal, from Northern Ireland to Greece and Cyprus. Newly accessioned countries as well as the ‘big 6’ EC members participated. The participants in the project are constituted as the Film Literacy Advisory Group, and previously worked on the European film education survey Screening Literacy which produced the Framework.